My hair routine is quite paired down since last time. I only apply one styling product to it when wet and on a normal hair wash then I only use three products which I'm quite happy about. The above products are all what I use when I wash my hair and leave it to dry naturally which is how I always wear my hair. If I'm curling it with tongs then it's a completely different set of products which I might write about at some point. Philip Kingsley Elasticizer | £29 // This is my all time favourite hair mask and I'll always have a tub of it in my bathroom cabinet. I also have quite a few mini tubes so I'm able to take it away with me on holiday. This isn't your typical hair mask though as you apply it before you shampoo. You get your hair wet and then apply the elasticizer to the lengths of your hair, clip it up and leave on for at least twenty mintues. I tend to leave it on for longer as I usually forget I have anything in my hair. Once the time is up then you simply shampoo and condition as usual. My hair always feels its best after I use this and it just looks a lot healthier. Phyto Phytoneutre Clarifying Detox Shampoo | £12.50 // This is clarifying shampoo is quite new to my collection and routine. I'm still loving and using Bumble & Bumbles Sunday Shampoo, but I've been testing this one from Phyto. First of all the mint scent is amazing and feels cooling and tingly when you apply it. I'm not a huge fan of the metal packaging as I find too much product comes out when you squeeze it, but I am looking forward to using the tube squeezer on it when it's near the end. The actual shampoo itself really helps to remove product build up and leaves your hair feeling very clean without drying out your scalp or shampoo. This hasn't irritated my sensitive scalp, instead it helps to soothe it. Sachajuan Scalp Shampoo | £18 // After a lot of testing, I have a list of shampoos that my scalp is ok with me using and this one from Sachajuan is one of them. I like the packaging and the scent although it isn't synthetic. There isn't anything outstanding about this shampoo, it just does the job nicely. It cleans my hair without stripping it or irritating my scalp and leaves my hair feeling nice once it's dry. You can read about some other shampoos that I like here. Naked Neroli & Cotton Seed Gentle Conditioner // I used to think I could get away with using any old conditioner, the cheaper the better, as it wasn't touching my scalp so therefore it wouldn't irritate it like some shampoos do. This is still the case, but then eczema started flaring up on my face and after a lot of testing, I put it down to the conditioner that I was using which was irritating my face when my hair touched it. When I started using a conditioner with better ingredients the irritation and eczema on my face went away. I was browsing the aisles of Boots looking for a new conditioner as I had just finished the last tube in my cupboard when I stumbled across the Naked products. I used to use one of their shampoos when the eczema on my scalp first flared up years ago and it really made a difference, but I had never tried any of their conditioners. I chose the Gentle Conditioner as I could understand all of the ingredients and it was half price. I fell in love with it after the first time I used it and then I found out Naked had stopped selling all their products and is the reason why it was half price in the first place. Scared I was going to get to the end of the tube and not find another conditioner that I liked, I ordered five more tubes from Boots. At this point, the price had been reduced even further so I think I paid £10 for the lot. It doesn't contain perfume or silicone and is only made up of eleven ingredients, all of which I can understand. It makes my hair easy to comb through and feels soft, but it doesn't weigh it down. I still only apply conditioner to the ends of my hair, but with this I haven't had any scalp or face irritation which is amazing. I've just finished the first tube and I have no idea what I'm going to use when I finally finish the last. I'm hoping this won't be for another year, but I'm already worrying! Sachajuan Hair Mousse | £20 // I still haven't found the perfect hair mousse that enhances my natural curl/wave, but doesn't leave it feeling dry or crispy. Any recomendations hen please leave them in the comments! This mousse from Sachajuan is what I'm using at the moment and I do really like it, but it's not the one. I feel like it's better at giving volume than enhancing curls and can sometimes leaves my hair feeling a little frizzy after a day or so. Since I only wash my hair once a week, then I really need the mousse to work throughout the week and not just the first day. 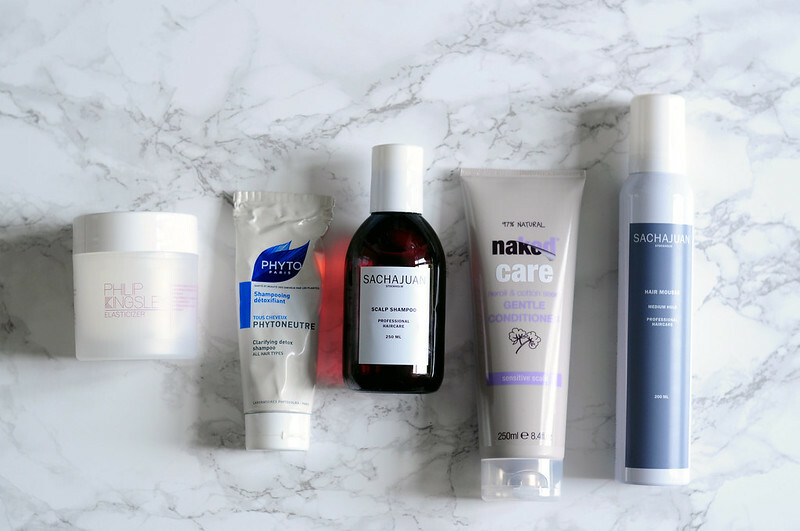 I've got a post lined up talking about all the scalp products I use to try and keep my dry and eczema prone scalp happy. I'll post a link here when it's live.